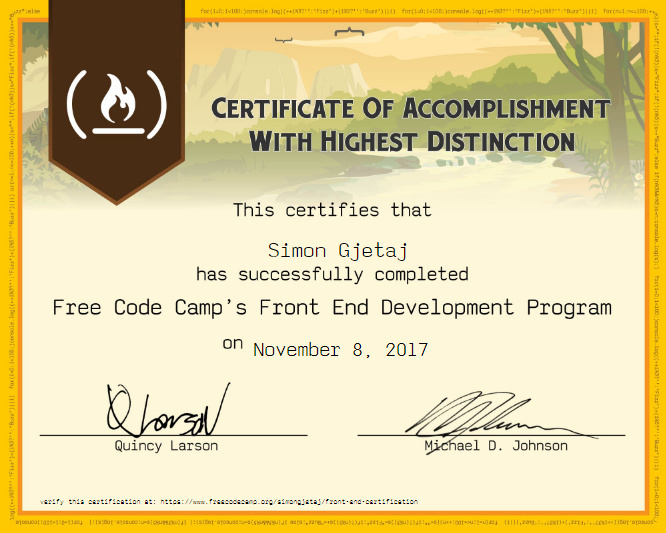 I just completed the Front-End certificate on Freecodecamp and I would like some feedback on how my portfolio looks for a potential employer. Advance warning: this is going to sound harsh. I’d remove the philosophy. You mention that you’re 20 years old. You don’t get to be “wise” (or a “purveyor of wisdom”) until you’re at least three times that age. And then you don’t call yourself “wise” (kinda like how no expert calls themselves an expert). More to the point, potential employers want to see evidence of what you can do, not assertions about what kind of person you are. Finding out what kind of person you are is what the interview is for, and then they’ll make their own assessment, rather than listening to yours. The same goes for “this list is not exhaustive”, which employers will read as “I’m not specialized in anything and I want to appear more experienced than I really am”. Instead of stating this, show it by including a short blurb under each project with the project name and the tech it was made with. That way, you can show that e.g. you have some experience working with Vue even though you don’t list it as a core competency. Also, host it (and your projects) somewhere other than Codepen. Having projects on Codepen doesn’t prove that you know how to structure a project or even how to write HTML boilerplate. With the criticism out of the way, I really like the overall visual design, font choices, landscape photo, text effects, and attractive use of semitranspacency. Overall, it’s actually a really nice portfolio page. You could make some adjustments to your CV. For example, remove your photo, address, certificate, languages and hobbies/interests. Fit everything on one page. Thank you for your comment @michal9909. I am not sure if anyone else noticed, but if you mouseover the icons under the “Font-End Developer” text, the screen appears jittery. Hey @simongjetaj. Nice work with the portfolio page and all the wonderful designs. I just noticed that the calculator accepts multiple decimal points. Like, you can make a number “0.1.2.3” if you want. A number in such format does not exist. You may correct it if you wish. Thank you for your comment and feedback. I will see what I can do. All the best to you, too.